Both machines use hydraulics to convert from transport position to working position. 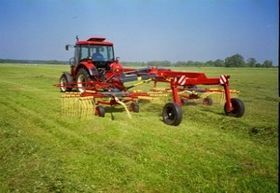 Would you like to find out more about the Rozmital SP682 Mid Row Rake? Call us on 01886 853 637 or fill in the contact form below and we will be in touch.